Bee-Sharp Honeybee is a brand new music and animation project currently in development. 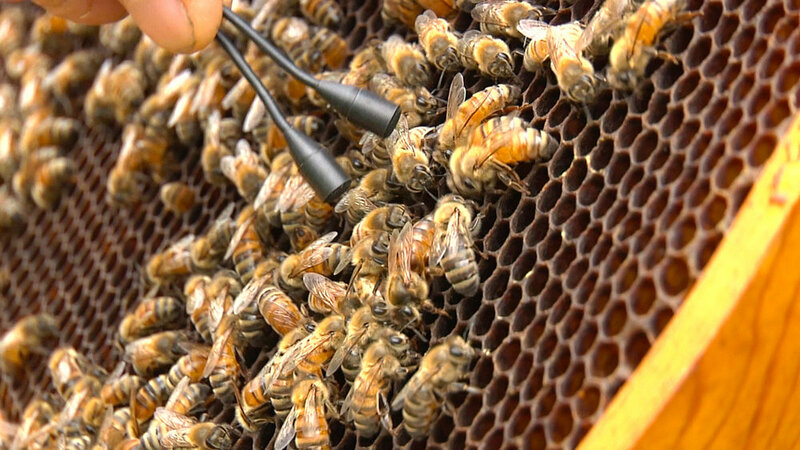 Inspired by the sound of the bee-buzz, it's an ambitious project, which will culminate in a live string orchestra work, to be performed with a live stream of bees and animated visuals, derived from hand-illustrated graphic scores. Foremost, it's a contribution to help spread the word about bee culture, promote bee research and educate the public about the importance of bees to human survival. The initial music sketches (composed by Rae Howell) and short documentary of the initial research process (directed by Deacon Warner) are hot off the press!! These Res Box events explore the film, the music making, and the animation creation, featuring interactive and behind-the-scenes activities to give you a real-time experience of the development of Bee-Sharp Honeybee. Jacqueline Ultan is a performing cellist, composer and improviser with a versatility that is reflected in the diversity of her artistic collaborations that include drum/cello quartet Jelloslave; Mirrorlands (Persian fusion), pop/rock band The Starfolk; improvising collective Sans le System/ iNMiGRATiON; Douglas Ewarts' Quasar; Siama’s Congo World Quartet; flute/cello duo J2J; and free improv ensemble Antigravity. Jacqueline has recorded and collaborated extensively with local and national theater, dance, pop, rock, and new music artists including Kill The Vultures, Roma di Luna, The Jayhawks, Dan Wilson, E. Carlos Sakai, Huun Hur Tu and Kevin Kling. Jacqueline has been recognized with several grants and awards including both MacPhail Artist and Commissioning Grants; MRAC Next Step Fund; McKnight Performing Artist Fellowship; MN State Arts Board Arts Tour MN (Jelloslave) and a Subito Grant from the American Composer’s Forum. In 2011, she was invited to be a featured artist for the inaugural 416 Club Commission Series with support from the Jerome Foundation, at The Cedar Cultural Center. Jacqueline has also composed music for and participated in TED TALKS! 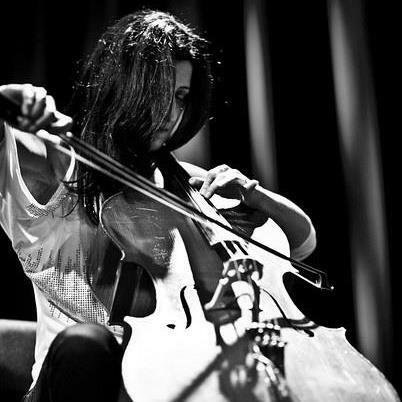 Conferences in Minneapolis and L.A. A dedicated teacher on faculty at the MacPhail Center for Music and Minneapolis’ Community and Technical College, Jacqueline holds a Masters Degree in Cello Performance from Yale University. Bee a part of the animation creation for Bee-Sharp Honeybee: An interactive and hands-on experience with resident animator Emily Downes. You can create, construct and immerse yourself in the actual stop-motion creation that is headed for the final Bee-Sharp audio-visual extravaganza. Who knows what kind of spectacle we can create?! Emily Downes was born in Wisconsin and has spent most of her time between Milwaukee, WI and Minneapolis, MN. She received both her BFA and MFA in Film, Video, Animation and New Genres from the University of Wisconsin-Milwaukee. She is most passionate about sharing her talents for digital and media arts with all ages while collaborating with local artists to build a strong and vibrant community. She is driven to provide youth and young adults the necessary tools to enact change in their communities through the power of digital storytelling. 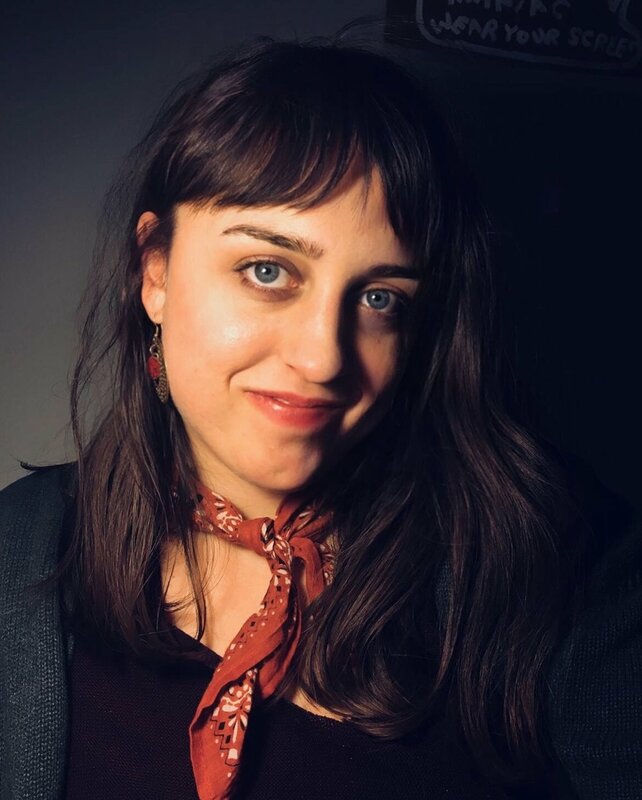 Emily has been teaching video, animation, and editing for several years and initiated the inclusion of these tools into classroom curriculums and after school programs in both Milwaukee and Minneapolis. Emily has showcased her videos and photography at film festivals and galleries worldwide, including The Short Film Corner at the Cannes Film Festival, The Milwaukee Film Festival, Minneapolis Underground Film Festival, The Grim Natwick Animation Film Festival, Chicago International REEL Shorts Film Festival, Echo Park Film Center, and Altered Esthetics Film Festival. Bee-Sharp Honeybee is a brand new music and animation project currently in development. Inspired by the sound of the bee-buzz, it's an ambitious undertaking, which will culminate in a live string orchestra work, to be performed with a live stream of bees and animated visuals, derived from hand-illustrated graphic scores. Foremost, it's a contribution to help spread the word about bee culture, promote bee research and educate the public about the importance of bees to human survival. is a Minneapolis-based sound artist. His interest is in the exploration of sound via research and artistic practice. Working within the intersections of art, science, music, and mathematics, he creates pieces that examine sonic morphology, spatialization, and human perception. Composition is realized through a combination of various digital synthesis methods and processing of recorded sounds. Work is often presented in site-specific multi-channel installations and performances which reveal the unique sonic footprint of the space and allows for the choreography of sound through speaker placement and animation of movement. Flora’s practice has included recording, performance, installation, video, choreography, and curatorial projects. His work has been presented at Stanford University’s Center for Computer Research in Music and Acoustics (CCRMA), St Cloud State University (Minnesota) as well as clubs, galleries, theaters, warehouses, and universities throughout North America. His latest recording “Xi” was published by Minnesota-based label Sympathy Limited. Active since 2009, Minneapolis based Grant Richardson has solidified a reputation for creating a strain of death industrial and power electronics that’s particularly ferocious, visceral, and just insanely heavy. Alongside Nyodene D, The Vomit Arsonist, and Steel Hook Prostheses, Gnawed represents an act at the forefront of a genre, whose music is built on a European foundation, but is sculpted and heightened with American aggression and intensity. A spoken word performance featuring poet Thomas LaBlanc (aka Strong Buffalo), with musical accompaniment by Jacqueline Ultan, cello and Dean "Dakota Blue" Peters, harmonica. The performance will include the first act of a play in progress, Tatanka, an intuitive historical drama through the eyes of one Dakota's life. 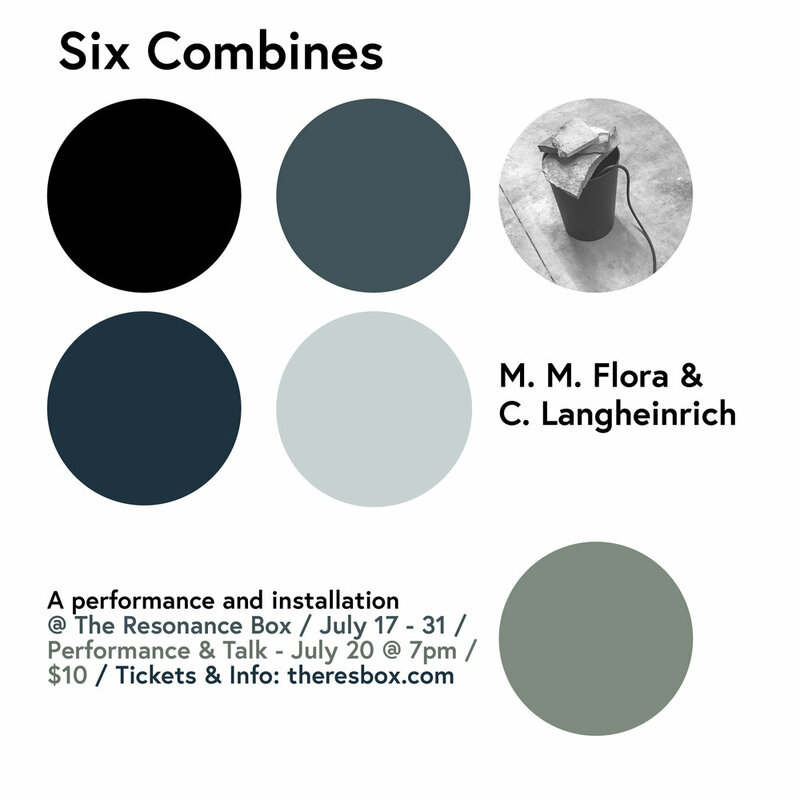 Join Michael and Christian for a conversation about their work which will be displayed at The Resonance Box July 17-31. Everything we take in must be digested, and some things are more nutritious than others. Sound waves are no exception. Join us for an evening of nutrient-dense sound healing and wisdom on the science and philosophy of sound as studied by Sat Devbir. All creation began with sound waves, and the worlds of form would immediately crumble without them. Through sacred singing bowls, gongs, and chanting, we can create soundscapes that restore the nervous system, clear the psyche, and induce homeostasis within the human energy field, essentially inducing our self-healing abilities. Sat Devbir Singh, Dr. of Divinity in Esoteric Spirituality, was born in Iowa and moved to Los Angeles at the age of 18 to embark on his spiritual journey. He is now an International Speaker, Yoga educator, Natural Healer, and Ordained Spiritual Minister. He believes that we all come to being as Masters of destiny, empowered to create fulfilling life experiences. He began his studies of sound healing in Northern India and has since integrated multiple sound instruments into his healing sessions, workshops, and classes. His mantra group, Helios, aims to share the healing fusion of mantra and music with the world. At an early age, he realized his ability to receive information from the spiritual world and his extrasensory gifts became apparent. From that moment forward, his greatest joy has been to help people realize the innate love, value, and wisdom within themselves. He hopes to uplift the planet in the spirit of Oneness and aims to unveil the True and Highest Self in every one of us. Over the past 10 years, Lawrence English has been one of the leading international voices in field recording. Working extensively across the world, from Antarctica to the Outback and the Amazon to Japan, his recordings display an utterly personal approach informed equally by technique, theoretical investigations and aesthetic interests. It is these unique approaches to field recording that form the basis of this masterclass. The Radical Listener sees Lawrence English guide participants through the specific techniques of field recording and listening he employs in his work. The Radical Listener has been presented at numerous festivals and universities including Unsound (Poland), Resonant Forms (Los Angeles), Substrata (Seattle), Brown University (Rhode Island) and as a lecture at the University Of Porto (Portugal), Harvard (Boston) and many other locations. Working across an eclectic array of aesthetic investigations, Englishs work prompts questions of field, perception and memory. He investigates the politics of perception, through live performance and installation, to create works that ponder subtle transformations of space and ask audiences to become aware of that which exists at the edge of perception. Embroidering by hand is a calming, relaxing, meditative process, a little like spending time at your favorite lake. 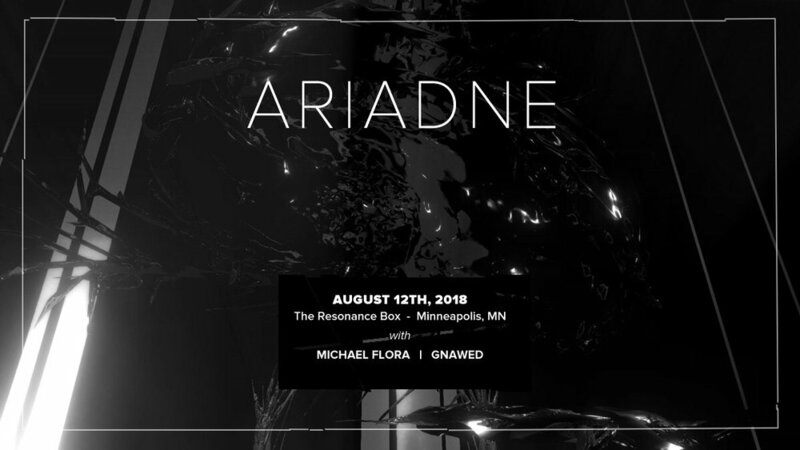 Join us while we paint portraits in thread while listening to the soothing sounds of water in nature in this special workshop with musician and sound artist Aida Shahghasemi and friends at The Resonance Box in South Minneapolis. When was the last time you paid close attention to how you were listening? No embroidery experience is required for this workshop, Portraits of Water. We'll be there to help you learn new stitches, choose your colors, and sew a portrait of your favorite Minneapolis Lake ( Lake of the Isles, Bde Make Ska, Cedar, Harriet or Nokomis) or if you prefer, practice your stitches in concentric circles, like a ripple spreading slowly on the surface. $80 includes all materials, 3 hours of instruction and all the sounds you can hear! We'd love to have you join us. Click here to register. Starfolk is a chamber pop trio from Minneapolis. They are the masterminds that created the badlands video-audio project alongside Jacqueline Ultan. come hear them create beauty at The Resonance Box. This performance will serve as a closing night for Jacqueline Ultan's month long exhibit called Conversations with Nature, an audio-video projection that will live at The Resonance Box for the month of March. The video will be presented twice for the half hour prior to the live musical performance. Original visual piece created by David Bartley will be projected behind the musicians as they play. Mirrorlands explores the intersection of contemporary Persian music and other musical forms... Its members include Jacqueline Ultan on cello, Tim O'Keefe on percussion, oud, and duduk, Saeed Hashemi on Setar, and Aida Shahghasemi as a vocalist. They will be presenting some pieces at The Resonance Box by some contemporary Persian composers alongside a few of their own compositions. Original visual piece created by David Bartley will be projected behind the musicians as they play. Monthly meeting of this interesting and diverse group is to be held at our very own space, The Resonance Box. Open to all and a warm welcome extended. The MSP Audio Geeks group started in March 2010, instigated by Carly Zuckweiler. They exist to foster community, learn from each other, share knowledge and insights, and geek out about a subject we hold dear. They meet in the Minneapolis and Saint Paul, MN area once a month to discuss all things audio. The group is comprised of over 150 individuals ranging from audio professionals to students to audio enthusiasts. Come to a monthly meetup and geek out! We had a fantastic opening with Gordon Hempton in our space on the 9th. You can still experience Dawn Chorus in surround sound at The Resonance Box through the end of January. We highly recommend you call at least a day in advance to ensure a reservation. With one person running the space for now, we simply can't be here all day and we would appreciate an early notice so we don't miss you. Join in for Resonance Box's grand opening with nothing less than an absolutely magical evening with the world renowned acoustic ecologist, Gordon Hempton and his treasured work, the DAWN CHORUS. Experience the rising of the sun from one side of planet earth to the other as the soundscapes shift around you. Concerned with the dwindling number of spaces on earth where total silence still lives, Gordon Hempton has dedicated more than 35 years of his life to the study and archiving of the sounds in our world. His work raises much needed awareness to how we listen, not just to one another, but more so to our surroundings, and the nature that we have mostly removed ourselves from. His work poetically opens our ears to the sounds that have guided the survival of our species, our intricate relationship with birds, and what we hear if we listen without any filters. Gordon Hempton has received recognition from the Charles A. Lindbergh Fund, the National Endowment for the Arts, and the Rolex Awards for Enterprise. He studied botany and plant pathology at the University of Wisconsin. His sound portraits, which record quickly vanishing natural soundscapes, have been featured in People magazine and a national PBS television documentary, Vanishing Dawn Chorus, which earned him an Emmy for Outstanding Individual Achievement. Hempton is subject of a feature film, Soundtracker, and co-author of One Square Inch of Silence: One Man's Quest to Preserve Quiet, (Free Press/Simon & Schuster, 2010). He is Founder and Vice President of One Square Inch of Silence Foundation and Quiet Planet. Hempton has now circled the globe three times in pursuit of nature's music and produced more than 60 albums available on iTunes. He lectures widely on the importance of listening. He lives in Port Townsend, Washington. Produced after nearly four decades of recording sunrise around the world, Gordon Hempton, The Sound Tracker, attempts his greatest masterpiece. We hear the rising sun sweep across the face of six continents. This global dawn chorus is a never ending wave of birdsong, evolving over time with the evolution of life itself. It is Gordon’s hope that this acoustic equivalent of NASA’s photo of Earth, will awaken our inherent reverence for life, all lives, not just human, and promote the need to protect places on Earth from noise pollution, so that we can continue to listen to what the Earth is telling us. And the Earth is speaking, if we would only listen. We are celebrating the Persian tradition of gathering on the longest night of the year at The Resonance Box. Its a bit of a last minute decision to share this with you, but we had to create a piece for the Iranian Students Associations of Carnegie Melon University and University of Pittsburgh and we thought it would be a waste to not share it in our own current home town. The event will be presented fully in Farsi. A story by Forough Keshavarz will be read and in between, there will be songs that are most likely quite familiar to you if you grew up in Iran for any portion of your life. We will have pomegranates dusted with Golpar. We won't keep you for long. You will make us truly happy by coming. As part of our holiday soft opening, we want to do our first seasonal fund raiser dinner. This even will for our first 12 lucky individuals to register. You will be invited to a three coarse, sit down Persian meal, meticulously made by Aida Shahghasemi, founder of The Resonance Box, paired with wine with our very own sommelier, Paul Cimmerer, while you mingle with others interested in exploring the rich Persian cuisine and listening to The Resonance Box's dinner playlist from Iran. This will be a high-end meal, cooked at Aida's home and catered to the space. We ask that you register and while paying for your seat, know that these are seasonal fundraiser meals and if you love The Resonance Box and what it does, feel free to contribute more. Space is very limited for these evenings. Please register early. Many thanks. This is our little invitation for you to join us for the holidays. We won't be officially open till January 2018, but we want to share our space with you. There will be hand-made gifts made available through a pop-up shop, K O O H self-care products for your loved ones, and oh ... carol singers. yes. Hot cocoa will be there to keep your hands warm.